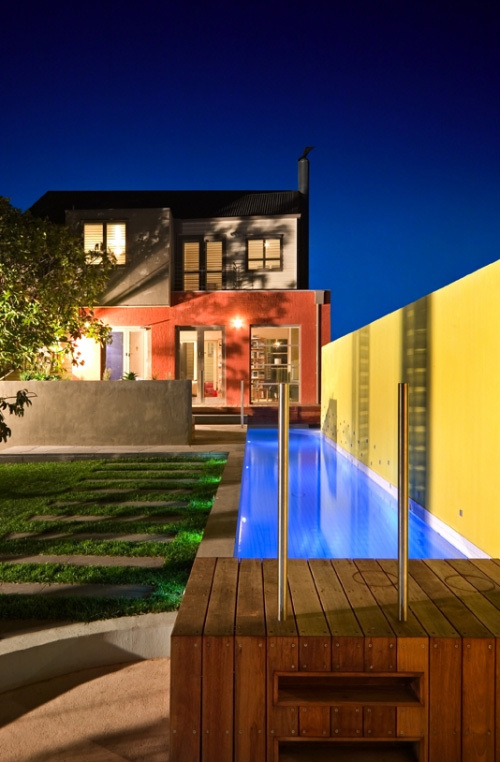 Presenting 5 Lap Pool Design Ideas by Out From The Blue. 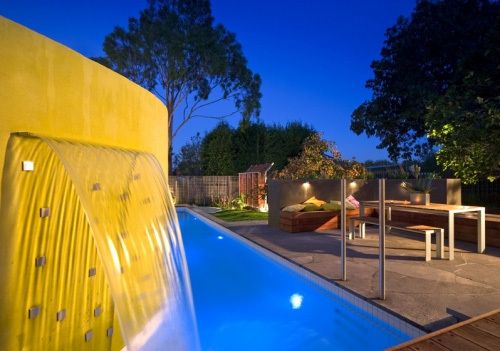 Located in Melbourne, Australia, Out From The Blue has designed and built some stunning lap pools based on the latest modern ideas. Lap Pools are becoming increasingly more popular as people are beginning to recognize the health benefits. Exercising in water is 11 times more resistant than air (so you’re challenging your muscles that much more), while any activities – aerobics, lengths, or stretches – is non-impact and better for joints and your whole body. Lap pools are generally modular in shape and smaller than regular swimming pools, as to encourage laps back-and-forth in the pool for exercise, but are completely customizable as you will see below. Designers are creating stunning lounge areas to complement the lap pools that they are a definite “wow” factor to any backyard. In this trend arcticle, we wanted to outline some of the most distinct features for each out of 5 pool designs. 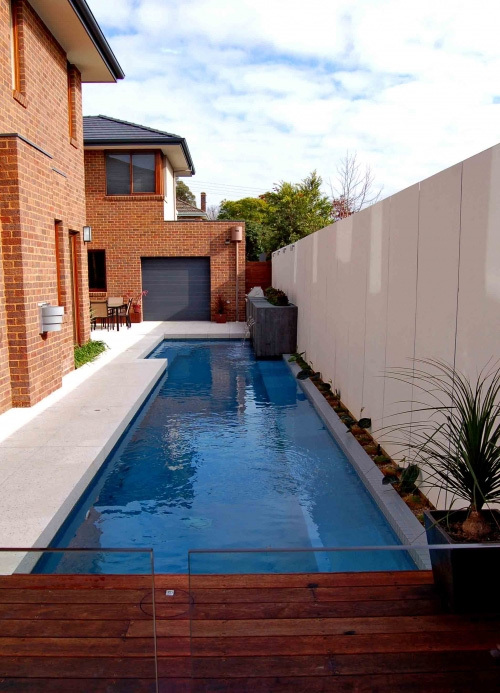 For more modern lap pool design ideas visit Out From The Blue. 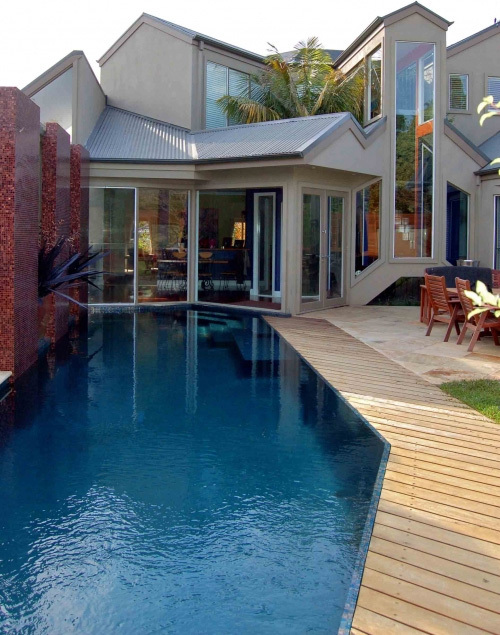 The Williams is an L-shaped, wet edge pool that was built into the layout of the house. 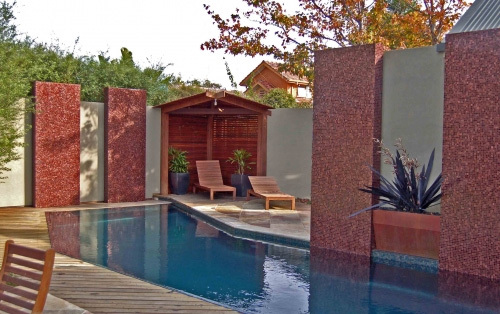 There is a lounge area that invites you to dip your feet into the pool and gently welcomes you in for a swim. This is the bottom of the L-shape, so if someone is swimming lengths, you can still enjoy a dip and not interrupt their exercising. At the end top of the L-shape there are stairs allowing you to exit the pool two different ways. There is a sitting area at the top of the L-shape as well. 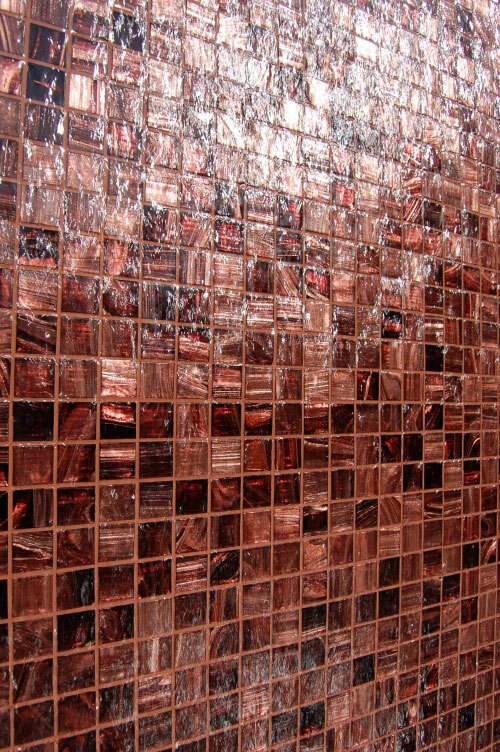 Glass Bisazza 20mm mosaic tiles and glass Coulson white mosaic tiles line the interior completing the feel of luxury from the lounge area to the bottom of the pool. 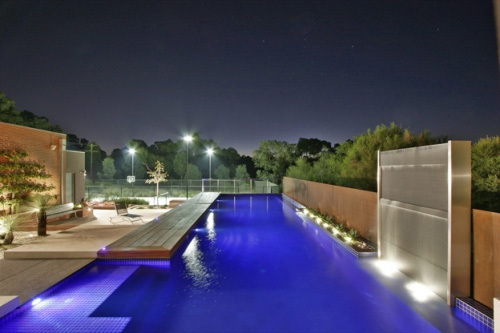 Spa Electrica Niche mounted lights encompass the outdoor pool area in a warm and intimate glow. 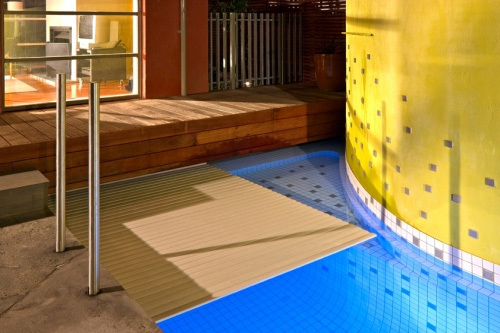 The Koral is a long and skinny, funky and functional pool. 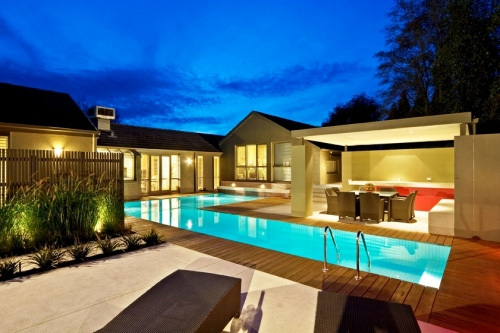 The owners swim lengths everyday so water temperature was a top priority. 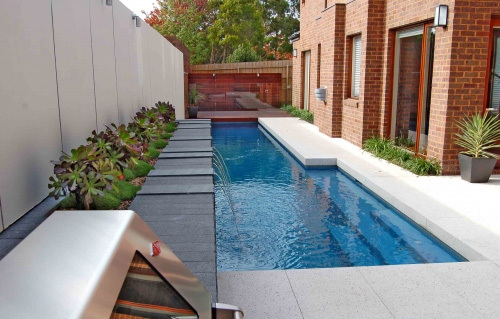 A solar and gas heated cover was installed to ensure the water stayed at a certain temperature, while maintained the security of the pool itself as well. The cover is concealed under the raised deck at the end of the pool where the fountain is. Simply press a button and the cover opens or closes with no hassle, no cords. The fountain wall is feature in itself. Hidden behind it is the equipment for the pool as well as some water tanks that collect rain water from the roof, which is used for garden use. Benches for cooling down, drying off or parents watching children swim, surround the long and skinny pool. The Moenhourt’s Smartsyd Cobalt Japanese tiles create a unique and exquisite feel to this design. To make it fit in with the existing landscape, a granite path leads to the pool area and ties in with the waterfall feature. The 15-meter pool is mainly for two lanes of laps, but the steps provide a sitting area if you just want to dip your feet and not disturb the lap swimmers. 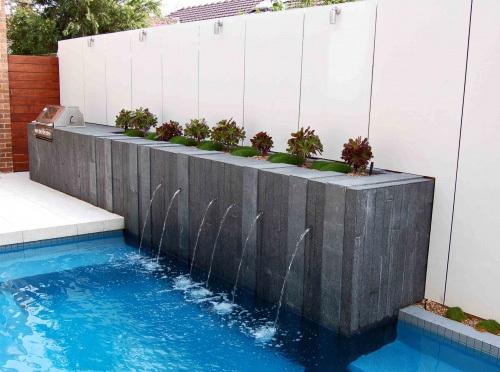 Planters line the edge of the pool adding some grace to this bold and beautiful idea. Spa Electrica Niche mounted lights also add a softening glow to the area, making poolside an elegant lounge area. The Courtyard Cool is family-friendly area where kids can play in the shallow areas while adults can take advantage of the deeper area for exercise with swim jets. The shape of the pool is unique in that it is a rectangular shape kitty-corner with a smaller square shape. The landscaped areas are very modern and clean cut with stones surrounding spiked plants accenting the deep, rich colors of the wooden fence. The deep blue colors on the feature wall create a punch of color while maintaining the contemporary feel. The Wet Walls and Wet Decks is a stunning feature in this backyard. As the pool walls are part of the house walls the luxury continues from the inside of the home all the way out. The red, glass Bisazza 20mm mosaic tiles add color and accent to this backyard and especially beside the neutral colors of the house. The deck is beautiful and unique in its design – you can climb out of the pool on the deck area where the water will drop back into the pool and then walk to the lounge area in the back corner of the yard. The deck gets rid of the eye-sore stairs that seem to have been the only option for years – until now.